Season 2 of House of Cards was released yesterday on Netflix. In sticking with Netflix’s formula, all the episodes were released at once, prompting a flurry of binge watching over the weekend (which yours truly will no doubt participate in). The show combines two of my favorite things: breaking the fourth wall and craven political drama. Despite its being Netflix’s first real bid at “prestige television” (a la The Sopranos, Breaking Bad, Mad Men), it’s not so much a great show as a soap opera with higher production values. I enjoy it nonetheless. One small thing I found interesting in the adaptation of the UK show House of Cards to the US is that while they kept the first name of the main character the same (Francis, played by Kevin Spacey), they changed his wife’s name from Elizabeth to Claire (played by Robin Wright). I assume this came from some unconscious sense that “Francis” and “Claire” simply go together as names, but even still the linking of those two names comes to us from Francis and Clare of Assisi. And while this more holy “power couple” might be a strange lens through which to see the political power couple, Clare of Assisi is the patron saint of television, so why not. By contrast, the love of Francis and Clare of Assisi was not borne of manipulation or the desire for power. Rather, as Leonardo Boff puts it, “The love for Christ and the poor did not diminish at all the deep love that united them, showing that between people who dedicate themselves to God and serving others, there can be true love and relationships of great tenderness.” This mutual call to give of themselves to God and to those in need was the foundation of mutual admiration, respect, and love. House of Cards begins with the election of a new President who had promised Secretary of State to Francis Underwood, but then breaks that promise in order to keep Underwood in the House. Thus begins a complex, brutal, and at times strangely elegant plot in order to gain even greater power for himself. Throughout the show, Francis Underwood is focused on increasing and consolidating his own power. At the new President’s inauguration, he tells the audience “Power is a lot like real estate. It’s all about location, location, location. The closer you are to the source the higher your property value.” Proximity to power is the rubric through which Underwood understands value. 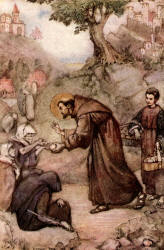 Francis and Clare of Assisi, by contrast, were both known for their generosity. Key stories about Francis include his encounter with the beggar, for which his friends mocked him, and his encounter with the leper. Moreover, both Francis and Clare lived as beggars, subsisting on received alms. Not only did they give generously themselves, without expecting an opportunity to lord it over their beneficiaries, but they made themselves vulnerable to the generosity of others. Unsurprisingly, these two couples live very different lives with very different motives. In my own self, I often desire to live like the Assisis, but I know too well the temptation to be like the Underwoods. As I begin watching season 2 this weekend, I wonder how much farther down the twisted path this show will go. 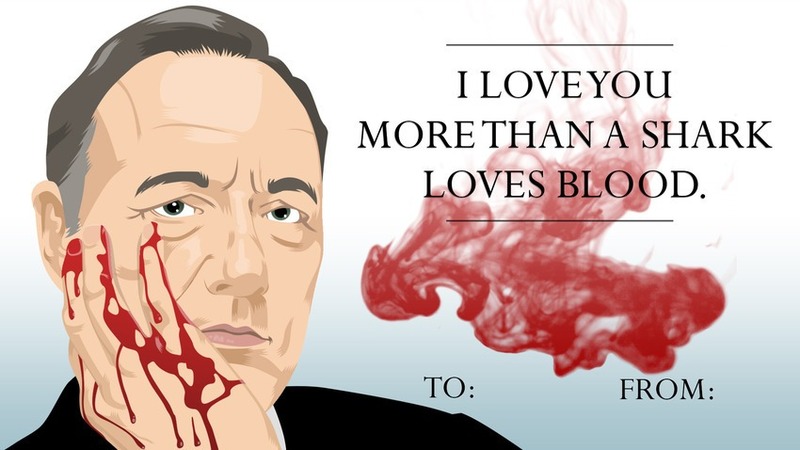 Potential spoiler: Francis Underwood (F.U.) claimed that kittens must be killed before they become cats. Francis of Assisi modeled love for all creation…Still, I prefer dogs. I love House of Cards as well but never considered comparing Francis and Claire Underwood to Francis and Clare Assisi; such an utter contrast between the politicians and the saints. In the Underwoods’ defense they are willing to do anything, including murder, to accomplish what they consider “the greater good.” So in their minds I suppose they consider themselves saints? Do saints ever bend the rules to achieve a greater good? A very telling scene for me was when a politician who had initially said she was going to take a high moral ground threatened to destroy the Underwoods by exposing some of their most personal secrets. Frank just smiled at her, told her he was glad she had finally come over to their side and then proceeded to destroy her.